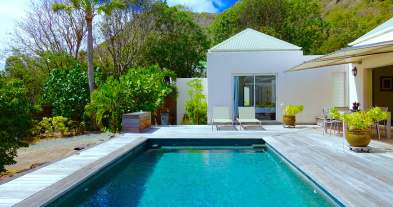 Villa JOE is a beautiful renovated 4 bedroom villa, ideal for families looking for total privacy, in a charming Creole atmosphere. 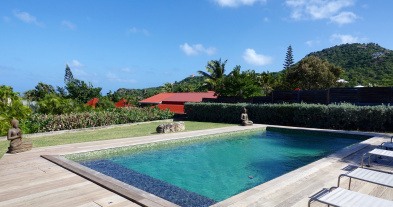 Villa JOE is a charming and comfortable 4 bedroom Creole style villa is nestled in Flamands Hills, just few minutes from the beach and shopping. The living room is fully air-conditioned and has a flat-screen TV with satellite and a very beautiful wooden parquet. The beautiful room opens to a nearby covered terrace and outdoor dining area and to a charming open-air kitchen, which can be closed off with wooden shutters. With white and blue accents and a nautical theme, the master suite has been crafted to emulate a ship’s cabin, making your stay a unique and one of a kind experience. The master bedroom, which is located off the living room, has a king-size bed or twin beds and an en suite bathroom with shower and vanity. All the bedroom is made from beautiful mahogany wooden floors, walls, and cabinets. A second and third bedrooms are also off the living room with theirs ensuite bathrooms while the fourth bedroom is on the same main floor with an office area. 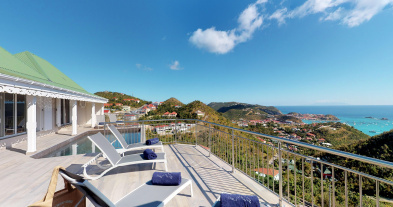 Perfect for families or young couples traveling together this St Barts villa offers amenities necessary for a comfortable and carefree stay. Such as plush outdoor seating by the pool as well as an outdoor barbecue. 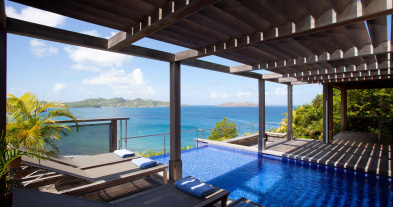 Villa JOE has a perfect laid-back and relaxing atmosphere offering complete peace of mind to ensure a memorable St. Barts Holiday.